TRC Recreation, LP is headquartered in Wichita Falls, TX with a secondary manufacturing facility in Graham, TX. 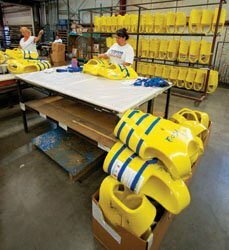 TRC Recreation, LP was founded in 1957 by Robert S. Scheurer, a pioneer of personal flotation products in the vinyl coating industry. The first product made by the company was the SKI-MASTER Vinyl-Coated Ski Belt, which was the very first vinyl-coated foam flotation product ever made! In the early 1960’s an additional brand name was registered, SUPER-SOFT. This brand name is now recognized world-wide as a leader in vinyl-coated products. In 1967, TRC Recreation, LP developed and introduced the world’s FIRST Coast Guard Approved wrap-around Water Ski Vest made of vinyl-covered closed-cell foam. This was followed with the invention and introduction of the present external strap Ski Vests, which was Coast Guard Approved the very first year that TYPE III Coast Guard Approvals were allowed. The SUPER-SOFT vinyl-covered closed-cell foam vests were also approved by the Canadian Coast Guard and CE (Europe Community) Approved. This design is still the leading vinyl-coated closed-cell foam Ski Vest on the market! TRC Recreation, LP continues to be a leading innovator and manufacturer of exceptional water and outdoor recreational products including: pool floats, floating chairs and lounges, spa pillows, water toys, games and accessories plus many more fresh designs each year. TRC Recreation holds many patents and has numerous registered trademarks. TRC Recreation, LP is an eco-friendly pacesetter, initiating “best practices” for responsible recycling, thereby reducing water and air pollutants. Both US manufacturing plants are equipped with regenerative thermal oxidizers that extinguish VOCs and refine the air before releasing it into the atmosphere. Both plants recycle many products in the manufacturing process. Recycled, granulated foam is reused in new, updated products! TRC Recreation, LP is a responsible partner with our world, designing and manufacturing products that last and provide years of enjoyment, safety and fun!